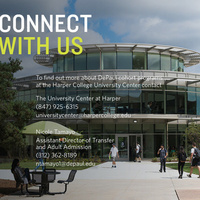 Have you been wanting more information on transferring to DePaul University? Drop by the University Center for walk-in Wednesday! A DePaul University transfer counselor will be available on a first come, first served basis between the hours of 10AM and 12PM, and 1PM-3PM.